A bit of news, a bit of eBay, a bit of painting and also a bit of time and space travelling for today’s blog post. Let’s get started! First off, the Phone boxes I mentioned last post are now on eBay! As well as some unpainted ones, I have also painted ones for sale. When I painted the K9 Phone box, I found that giving it a good black primer coat first was the best way to go. The black would be the colour of the windows, so rather than painting in each windowpane individually which would be very difficult, painting just the red of the window frames and box while leaving the windows black would lead to far better results. After the black undercoat, I painted a couple of coats of red before the white detailing on the top and the silver of the handle, then a dark wash before dry brushing the entire thing with more red. Painting the Postbox and Phone Box are pretty similar. With the RAC and AA boxes, you have to be very gentle painting the badges. Thick paint will ruin the embossed detail but too watery a paint will fill the detail also. So when painting the AA and RAC call boxes take care to get the paint thickness just right and keep a steady hand! Painting yellow onto black is a headache as the yellow shows up green and will need many many coats of paint to ensure the black paint doesn’t show through. I found that creating a small mix of 2 parts yellow, 1 part white and 1 part metallic gold acrylic paint did a good job of looking yellow and blocking out the black in only one or two coats. If you have other ideas about the best way of painting yellow onto black, drop me a line! Dry brushing with a dark grey on the black AA Call Box is a must and it really helps bring out the shape of the unusual roof. A dark wash on the RAC box really adds definition to the woodwork around the entire structure. I hope those painting tips help. More models are on the way! I should have another 1:100 item going on sale soon. If you play the tabletop wargame Flames of War, I think you’re going to like it! It’s a V2 rocket! I’ll be working on the building instructions this week and with a bit of luck it should be flying it’s way to eBay next week! And now a bit of time and space travelling! I’m a fan of Doctor Who, so it’s no surprise that I made a resin Police Box. I’m also a fan of Community, so it’s also no surprise that I’ve made Inspector Spacetimes space and time travelling Red Phone Box as well! If like me you want to follow the Inspectors adventures, there is a link to a new hilarious fan made web series… but where is it? Or do I mean when is it? It’s here but watch out for the Cyber-Chaps!!! 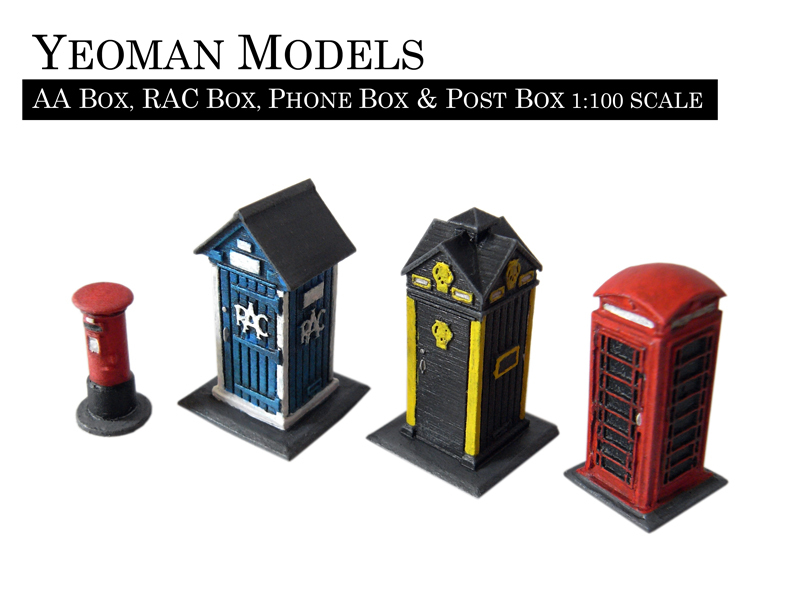 ← Here are some AA, RAC, Phone and Post boxes, hot off the press!